General Motors won't start the hard sell of its shares to investors, called a "road show," until Nov. 3, one day after mid-term elections, and the actual IPO now expected Nov. 18. Why? Politics, of course. GM's drive to get its IPO launched as soon as possible has always struck some critics as politically motivated, attempting to give the Obama administration a "Mission Accomplished" moment just before the Nov. 2 elections. GM executives have said the timing was simply an effort to get rid of the "Government Motors" tag as soon as possible. So why was the pitch pushed back to start one day after the election rather than next month? Reuters reports the delay will give GM a chance to include third-quarter earnings in the presentation to potential investors. But GM has also warned that its results for the remainder of the year would not match those of the first half, and since the quarter ends Sept. 30, there should still be plenty of time for GM to make a pitch pre-election. But, with Republicans expected to win scores of seats in this year's campaigns, a pre-election GM road show has the potential to generate far more political attention than even the Obama administration wants. Any GM pitch held before the election could spark the type of demonstrations that threw health-care town halls into chaos last year. 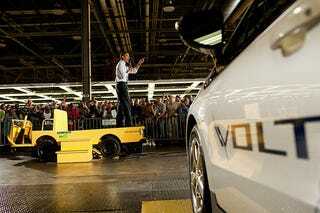 Any Republican candidate worth the name could use the GM road show as an effective backdrop, given that the GM bailout ranks among the most unpopular acts President Barack Obama has taken in office. By starting the day after the elections, the road show removes such pressures while giving the Obama administration one more piece of data to work with in deciding how much of its 60.1% GM stake it wants to put on the market. If Democrats lose one or even both houses in Congress, the pressure will be biased toward selling more. But if Democrats stave off the worst and Obama can claim some small victory, the administration has more breathing room to wait for higher returns. A few months ago, GM's IPO seemed like a sure bet, with $20 billion estimates for its size being floated and strong potential interest from big investors. Since then, the economy has slowed, GM's board has hired its fourth CEO in 18 months and its numbers have come under more scrutiny. The road show will play up GM's strengths in new models and new management. But GM's best bet may be to embrace the political aspects of its story rather than running from them. There's $50 billion of public money that has kept the company alive, and it's fair to tell critics that rooting against GM means rooting against yourself and your country.